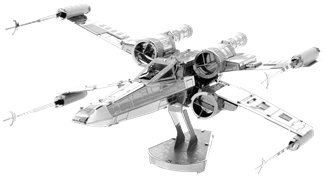 A two-seat strike fighter used by the First Order’s elite Special Forces pilots, the TIE/SF boasts weapons far more powerful than a standard TIE, combining laser cannons with a heavy turret and warhead launcher. Special Forces TIEs have hyperdrives, deflector shields and high-yield cells that provide additional power to onboard systems. These versatile attack ships are used for everything from reconnaissance to combat operations. 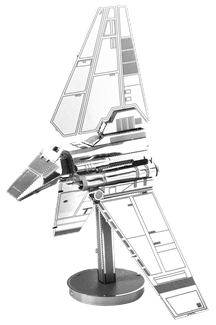 Kylo Ren's command shuttle was an Upsilon-class command shuttle utilized by Lord Kylo Ren, who was a member of the Knights of Ren and the First Order around thirty years after the Battle of Endor. The First Order’s top officers travel in Upsilon-class command shuttles that look like grim birds of prey. 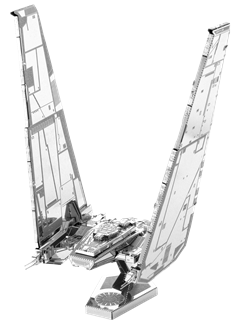 These ships’ massive wings are packed with defensive systems to protect their valuable passengers. The upper wings contain advanced sensor suites that scan for enemies, while the lower wings house efficient shield projectors and powerful jammers. Upon landing, the wings rise from flight mode and then retract, encasing the upper wings’ sensor arrays in thick armor. 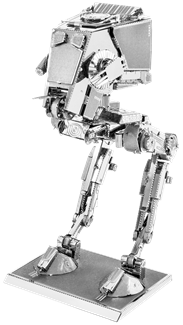 While not as imposing as its larger AT-AT walker cousin, the AT-ST nonetheless served as a significant addition to the Imperial side of battlefields in the Galactic Civil War. The two-man craft is lightly armed with chin-mounted laser cannons, and side-mounted weapon pods. 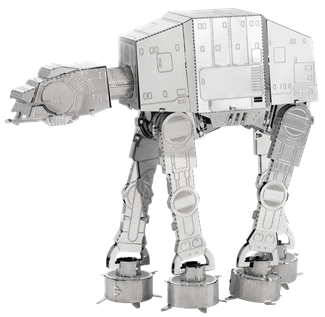 The two-legged transport, dubbed the scout walker by many, serves as a reconnaissance and patrol vehicle, often flanking approaching AT-ATs and mopping up infantry that sneaks past the larger walkers. The Imperials used AT-STs in both the Battle of Hoth and the Battle of Endor. The deadly Slave I was infamous for its association with Jango Fett, a bounty hunter in Mandalorian armor. Fett packed the craft with weapons, from laser cannons and projectile launchers to seismic charges. After Jango's death, Boba Fett refitted Slave I and made it his own. A generation after his father's death, the distinctive craft remained the last thing fugitives wanted to see on their scanners. An elegant example that stands apart from typical brutish Imperial engineering, the Lambda-class shuttle is a multi-purpose transport used in the Imperial Starfleet. The Empire pressed the shuttle into service for both cargo ferrying and passenger duty. Even the Empire's elite, like Darth Vader and the Emperor Palpatine used these shuttles. It has three wings: a stationary center foil and two articulated flanking wings. When in flight, the side wings fold out for greater stabilization. When landing, the wings fold in, shrinking the vessel's silhouette. 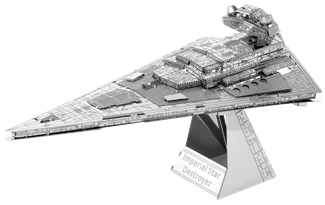 The well-armed vessel has two forward-facing double laser cannons, two wing-mounted double cannons, and a rear-facing double laser cannon. It is equipped with a hyper drive. When stationed on Hoth, the Rebel Alliance modified T-47 air speeders to become snowspeeders, fast flying conveyances for patrol and defense of their hidden base. It took some doing to keep the crippling cold from permanently grounding their air force, but Rebel ingenuity overcame the relentless Hoth elements. The T-47 air speeder is a small, wedge-shaped craft with two forward-facing laser cannons. In its rear arc is a harpoon gun fitted with a heavy-duty tow cable. The snowspeeder is a two-man vessel, with a pilot and rear-facing tail gunner. 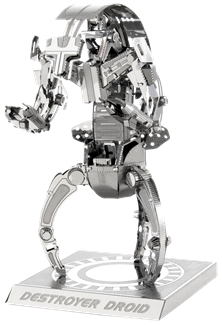 Destroyer Droids, also known as Droidekas, were used by the Trade Federation during the invasion of the planet Naboo. These droids had shield generators and could curl into a ball for rapid movement. 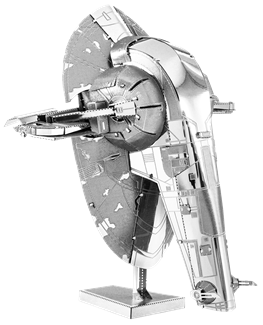 Is a starfighter from the original Star Wars trilogy and the expanded universe. They are depicted as the primary interceptor and dogfighter of the Rebel Alliance and the New Republic. 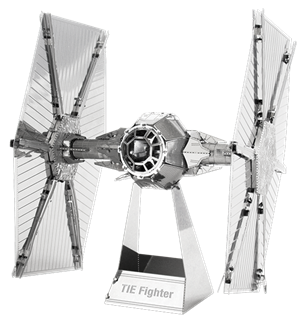 TIE Fighters are one-man starfighters with a spherical cockpit, hexagonal wings and two chin-mounted laser canons. 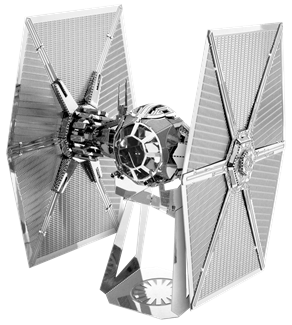 The basic TIE fighter first appeared in A New Hope and is the primary Imperial fighter seen in the Original Trilogy.